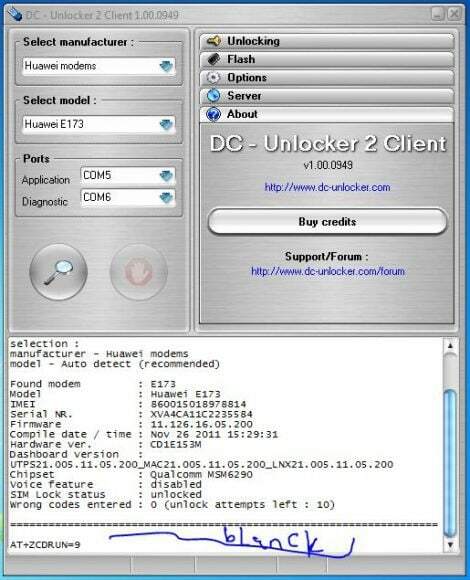 Recently I got complains from users who happened to flash their modem using dc-unlocker software specially the zte mf180, mf190 and mf100 series that after flashing their zte modem the cd auto-run feature became disabled. Meaning they can’t just use their modem on new computer without first looking for the zte connection manager elsewhere. They have to either install the connection manager from a friend or download from 9Mobile (formerly Etisalat) website. This is because most of the victims are Etisalat zte mf180 users . But enabling of Cd auto-run for ZTE modems can easily be achieved via ZTE at commands line . Now to disable/enable virtual cd auto-run for your usb modem and/or internet dongle, simply download either putty.exe or this version of dc-unlocker client with unlimited credits. Then launch the dc crap client and auto search for your USB modem. Note that – you must choose zte datacards option from the list of modem manufacturers. enter AT+ZCDRUN=8 and hit enter ==> then enter AT+ZCDRUN=9 and press the enter button again. Notice that immediately after hitting the enter button, you’ll receive a message telling you that it’s successful. Congrats! Your ZTE USB modem’s virtual CD auto run is enabled and won’t get disabled again! Have other questions on USB modems, internet dongles or general questions on ZTE modem unlocking, please do let us know about them in comments. am having a problem with my modem. it prompts modem network card drivers invalid, i need some help please.